Work zone - Turn on Headlights. Work Zone Signs are normally diamond shaped, like warning signs, but they are orange with black lettering instead of yellow with black lettering. These signs identify maintenance, construction or utility areas where workers or equipment may be on or near the roadway. Stay alert and slow down when you see these signs. 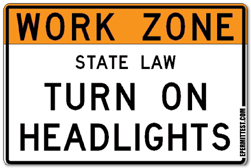 Some states require that you turn on your headlights when traveling through a work zone, no matter what time of day.